The disastrous fire in 1731 that scorched the pages of Beowulf in the library of Sir Robert Cotton also destroyed or damaged many other manuscripts, one of which, designated Otho A.xii, contained The Battle of Maldon. Although the manuscript, itself, perished, the deputy keeper of the library had made a copy several years before. It is this transcription that preserves what is considered to be the greatest battle poem in English. As can be seen, the orthography of Old English differs from contemporary usage. 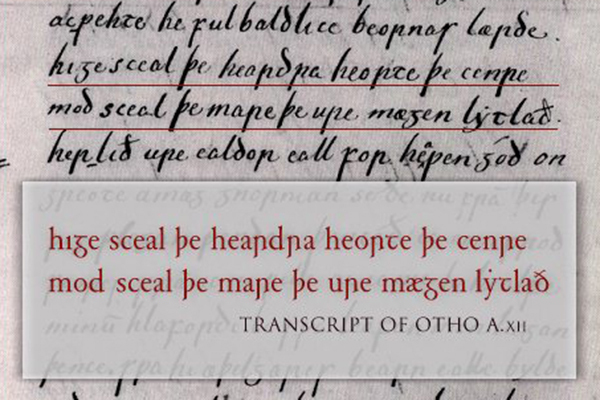 Certain sounds in Old English cannot be reproduced in the Latin alphabet and were augmented by Anglo-Saxon scribes with characters from the runic alphabet (Futhorc). The sound of "th" was conveyed by thorn (capital Þ, lower case þ), as in þe (the) above. With the advent of printing late in the fifteenth century, this character was represented by the letter "y," which survives as the archaism "ye" in "Ye Olde Tea Shoppe." Wynn was introduced to convey the sound of "w" and is transcribed by the same letter in modern translations. (In original manuscripts, however, it looks much like the letter "p," which may be why the letter is not used to replace thorn.) Eth (Ð, ð) also was used by scribes to convey the sound of "th" but, because of the redundancy, eventually fell into disuse. Ash was represented by the ligature digraph "æ," as can be seen in mægen. Other characters in Old English simply were written differently, e.g., the "g" (yogh) in hige, the "r" in heardra, the "t" in heorte. courage must be the greater, as our might lessens." They reflect the heroic ethos of Old English literature, which derives from the conventions of the Germanic "comitatus" relationship described by Tacitus in his Germania (AD 98) nearly nine-hundred years before. It is the reciprocal obligation of the lord and his retainer: the generous giving of gifts in exchange for devoted loyalty, in which the honor and glory of both are defined. These lines are the most well known of the poem and seem never to be translated in the same way. Even before the fire, the beginning and ending of the poem were missing. It is not certain how much has been lost, but the poem had been written on three double sheets that were folded over to make six leaves or twelve pages. Anglo-Saxon books regularly consisted of quires of four double sheets, and it is possible that the poem was written on such a quire but that the outer sheet was lost or, if most of the last page had been blank, that the expensive vellum was reused. If so, one can assume that fifty or so lines might be missing from the two pages of the initial leaf and perhaps a bit more than that from the end.